A recent review of our cellar revealed that the winery Giant Steps (GS) has a lot to answer for when it comes to my drinking choices. Giant Steps and Innocent Bystander both hold a long standing spot in our cellar but that has now expanded to include wines made independently by former and current GS winemakers, such as Salo Wines (winemakers Steve Flamsteed and Dave Mackintosh, current and former winemakers for GS), Ar Fion (Dave Mackintosh), Dirty Three Wines (Cameron Mackenzie former winemaker with GS) and now, if that wasn’t enough, Four Pillars Gin, headed up by Cameron Mackenzie, seems to have snuck its way into our house. Mr. Sexton, we really need to talk if my liver is to survive!! Four Pillars is a tiny company producing some top quality gin in the Yarra Valley. 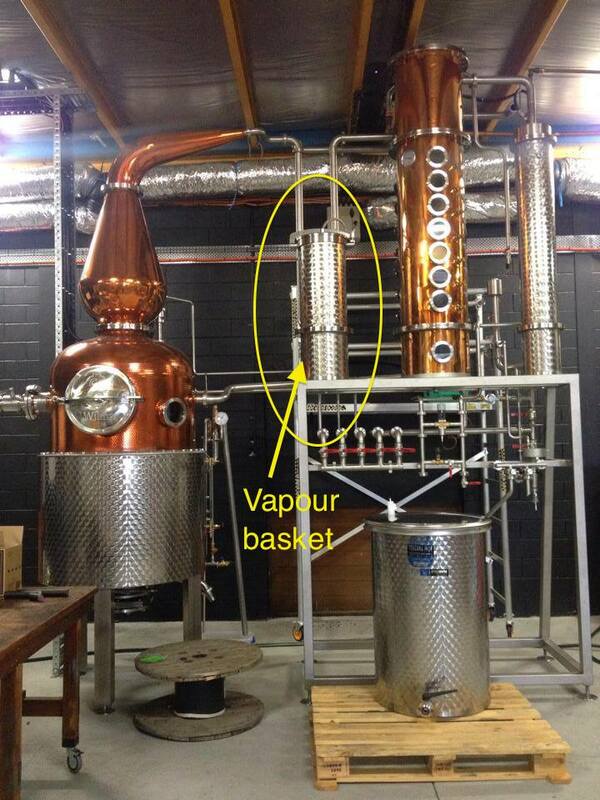 A couple of things add to the unique style of Four Pillars – the use of Tasmanian pepper berry leaf in the botanicals recipe and the use of a vapour basket during distillation. Typically in the production of gin, the neutral spirit and in this case a grain spirit, is distilled in a pot still either with the botanicals mixed in with the spirit or after the botanicals have been macerated in the spirit. During distillation the alcohol rich vapours are collected in a narrow tube, or the lyne arm of the still before they are condensed and collected. A distiller has the option to feed these vapours through a basket, which usually holds dried citrus peel, after which they are passed through a condenser and collected as full strength gin. This process adds another layer of complexity to the final product with the addition of flavours from the dried peel to the overall flavour profile. Some other producers who use this method include Tanqueray for their Tanqueray 10 gin and the City of London Distillery gin among others. Where Four Pillars differentiates itself is that instead of dried citrus peel they use fresh oranges cut in half. The effect is an intense orange note to the gin, alongside clear notes of cinnamon, cardamom, and pepper berry to name but a few. Perhaps more accurately, the effect is a rather delicious gin that when paired with the right tonic water makes an unstoppable combination and with two gold medals at the recent San Francisco World Spirits Competition I am certainly not alone in my appreciation! So while I am most definitely the Happy Wine Woman, I do have moments as the Grateful Gin Gal particularly when I see the number of top quality gins readily available to the market! So glad you could join us for our G’Vine Hong Kong launch, and after meeting in Melbourne sorry we didn’t get the chance to say hello again! Thanks for the review!